After months of leaks and recent mock-ups of what the iPhone 6 may look like, odds are pretty good that we’ll see a larger iPhone model this year. If we do, this will only be the second time since 2007 that Apple(s aapl) has chosen a larger screen for the handset: The original iPhone had a 3.5-inch display and in 2012, Apple bumped the size up to 4 inches for the iPhone 5. Although both a 4.7- and a 5.5-inch display have been tipped for the iPhone 6, my money is on the former size. Either way, a decision to boost screen size will have many implications for Apple’s next iPhone. Let’s face it: There is no “one size fits all” when it comes to smartphones, because we don’t all have the same size of hands. And once you increase the size of a handset display, there will inevitably some people who can’t use the phone without using both hands. I don’t think this will be a huge impact if the iPhone 6 is larger, particularly if the screen size is 4.7 inches, but some people will notice it. I expect Apple to do everything it can with the new iPhone design to minimize the impact of a larger phone, however. That’s exactly what Motorola(s goog) did with the Moto X, which just so happens to use a 4.7-inch display even though it’s not that much bigger than an iPhone. I can use both my iPhone 5s and my Moto X with one hand, for example, even though the Moto X display is 0.7 inches larger diagonally. Mock-ups of the iPhone 6 recently appeared online and, if accurate, show a design choice that illustrates what I expect: The phone’s power/wake button is on the side of the device. That’s another way to ease one-handed use because you don’t have to reach atop a larger phone for the button. With reduced bezels around the display, I think Apple can minimize the impact of one-handed use for most people. While Apple could increase the display size and keep the phone width the same, that’s not very practical. Such a choice would create an odd aspect ratio, for starters. And it would make for a very tall phone. Instead, any screen size boost would likely come from a display that’s both taller and wider. The width of the iPhone hasn’t changed much in seven years — the variance in all models is just a range of 3.5 millimeters — but that’s probably changing with the iPhone 6. Oh wait: A thinner iPhone with bigger display is going to have less battery life, right? Not necessarily. A thinner iPhone would mean a thinner battery, but that battery can take advantage of the extra space created by a taller, wider iPhone. Apple likely wouldn’t sacrifice much (if any) battery life in a larger handset, so I suspect it will work with its battery partners to create a larger but thinner battery that offers similar capacity to the current iPhone 5s power pack, which has 1,570 mAh of capacity. Even if the iPhone 6 battery capacity is less than that of today’s iPhone, a new A8 processor could be optimized for improved power consumption to maintain long run-times on a single charge. It’s possible that Apple would keep the same display resolution on the iPhone 6 as it has on the current models, but that’s highly unlikely. Stretching out more pixels on a larger display reduces the pixel density and selling point of Apple’s Retina Display. Take the 1136 x 640 resolution of today’s iPhone 5s, for example: On a 4-inch display, you get 326 pixels per inch (PPI), which is above the 300 PPI on a device held around 10 to 12 inches from the eye needed to meet Apple’s criteria for a Retina Display. Spread the same resolution across 4.7 inches and the pixels per inch drops to 277 PPI. That’s a step backward, not forward. It’s far more likely for a bigger iPhone 6 to require a change in resolution. In January, I suggested that the 1136 x 640 resolution of the iPhone 5 was more of a “one-off” solution to this challenge and that the next iPhone would use a 1440 x 960 resolution screen. That’s exactly 150 percent of the 960 x 640 display on Apple’s first 4-inch phones. A 4.7-inch iPhone with this display resolution would provide an even sharper screen (when held at the same distance from the eye, that is) at 368 PPI. That’s definitely forward progress, making for a clearer display while also being relatively simple for developers to deal with. Now that 1920 x 1080 resolution is becoming standard fare on flagship Google Android phones, however, I’ll say there’s an outside chance that a larger iPhone 6 could use a screen even better than 1440 x 960. If that’s the case, I’d guess we’d see a true doubling of pixels from the 960 x 640 resolution, giving the iPhone 6 a screen with 1920 x 1280 resolution. That just so happens to be better than the 1080p displays used by Samsung, HTC and others, with an added benefit: high definition video content would natively fit the display, while leaving some extra pixels for playback control or other on-screen items. Regardless of what Apple thinks of large phones — or what it plans for the iPhone 6 — does a bigger iPhone appeal to you or are the current models just right. With the right design choices, I’d be happy to see a 4.7-inch iPhone to help show more content in greater clarity while still fitting nicely in a pocket or hand. I want a model of the same size i phone 4s for my carry in pocket, but Apple seems to want to turn cell phones into tablets, bad idea. I love use apple products but i phone anymore, I want a model of the same size i phone 4s for my carry in pocket, but Apple seems to want to turn cell phones into tablets, bad idea. I don’t currently have a compelling reason to upgrade my iPhone 4S. An iPhone with a usably larger screen (both taller and especially wider) would provide motivation. I use the phone almost exclusively for data access. I only occasionally use it single-handed. I have older eyes, big hands, and big pockets. 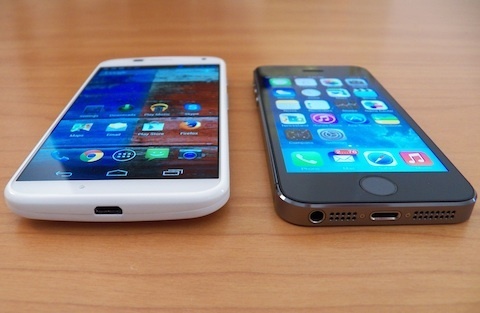 To me the small screen of the current iPhones feels very cramped – especially compared to 5″ screen Android phones. It’s past time for Apple to move away from this “phone as a phone” mentality. That’s not how they’re used anymore. We know it. Apple knows it. All the discussion about 1-handed use of the iPhone always baffles meâ€¦ you’re just asking for trouble using it 1-handedly, with slips likely– and a lack of easy control of various tap areas. It’s especially harder with cases on. When I tried the IPT with its larger screen, it felt imbalanced, as if it were going to fall forward out of the hand. The slippery metallic surface added to that feeling. I’m almost always using two hands anyway, so bring on the larger phones! When you say better than Samsung and HTC screens, you mean the higher PPI on a 4.7″ screen with 1080p display vs a 5″ screen on the Android devices with the same 1080p display? When you are at 10-12 inches away from the eye, like you have mentioned in the article, I don’t honestly think there will be a hue difference between ~440 PPI and ~460 PPI. Then again, Apple still has to deal with the screen resolution fragmentation issues that has driven Android developers crazy. If you have a 4.7″ device and you are showing a 4″ app with black screen around the app, that is way worse than having a native 4″ phone. So Apple has to address this (iOS 8.0/iOS 8.1) and have all their developers change their code to fit the larger screen between the time iPhone 6 is announced and they are on market. By “better” I’m simply pointing out the higher resolution specification. I would agree that at a certain point, PPI differences don’t matter to most eyes. Kevin. Any views on the impact that a larger retina screen would have on battery life? Thank you. I don’t think Apple will offer a larger, higher resolution display in a phone that gets noticeably less battery life, Paul. The company will design a way around that challenge either through a larger battery (since it would be in a larger phone), chip, screen and OS optimizations. Apple needs to go to design school. I always thought my IPhone 4 and 5 and 5s was beautiful like a piece of jewelry. If this new design is real with the round edges, there is nothing special in the design. It looks cheap for a medal phone! I hope all these IPhone 6 mock ups are all wrong. I think the biggest point that doesn’t seem to be mentioned here is how it will affect app developers. It stands to reason that they’ll have to develop separate versions of their apps for different screen resolutions. True, Kyle, but they’ve had to do so before and Apple has provided scaling tools for that which is why I didn’t focus on that. Apple will make the resolution change along with tools/solutions that make it as easy as possible for developers. I don’t expect a major developer uproar over whatever resolution path Apple chooses. When I got my Moto X my wife loved it. She thinks it is the best phone ever put out. She went as far as to say that she might give up her iPhone 5 for the Moto X then she did the pocket test. She tried to put it into her pants pockets and for some reason, women’s jean pants are always smaller than men’s so bamm… the phone didn’t fit. How did she react? As an Apple fan she said “I’ll wait to see if Apple adds the same features to the next iPhone”. See, she really wanted the Moto X but she preferred the size of the iPhone. With the release of a larger iPhone, I’m sure there will be a lot of happy people finally able to get a bigger phone but there will be people like my wife who were waiting for that final straw before switching to Android and this might be it. Whether or not Nokia’s hardware is as good isn’t the issue. Nobody comes close to Apple’s software quality. Hardware reached a point where mostly all flagship phones from all vendors are good enough, software is the differentiator now. I have an iPhone 5 simply because its pocket sized , wife has a Samsung Galaxy S4 its large and fits in her handbag ….I dont have a handbag so need a small enough phone to fit in my shirt or coat pocket. I agree with most everything the author stated. But he didn’really make a good case with the screenshot/video showing the purported iPhone 6 – that thing doesn’t look a lick thinner than the current iPhone 5s. That “leak” is definitely not 6mm thin. A 6mm thin iPhone 6 without side bezels would not sacrifice one-handed operation appreciably. The additional 1-2mm width could be made up for by a 1-2mm decrease in thickness. The height of the screen could, I think, be increased without affecting the height of the device due to the current thick bezels. Reaching the top of the screen with ones thumb, though, might be a bit more of a stretch than it already is for most iPhone 5 users.